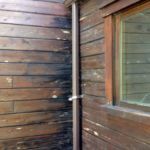 Log rot due to leaky gutters is a common problem, but one that can be hard to pinpoint for many homeowners. 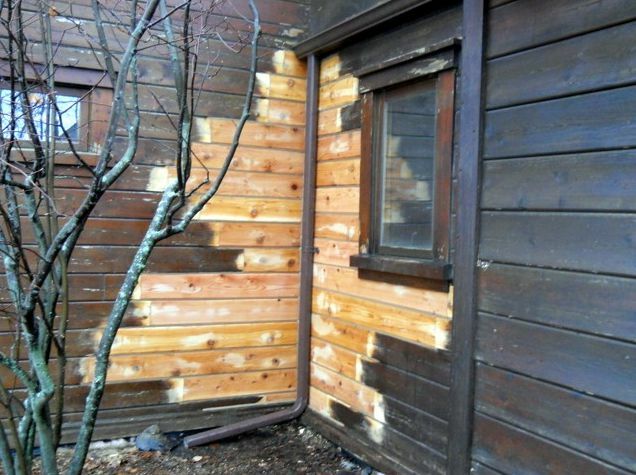 This log home near River Falls, WI was in need of repair. The Eggerts are from the Twin Cities, and for many years, they’ve enjoyed their quaint log cabin on the hill to escape the pressures of city life. 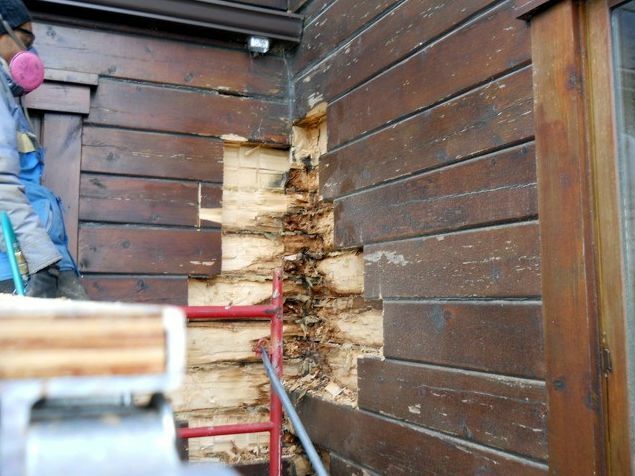 They contacted us in late summer 2013 and told us they had a corner that had some issues with rotten logs. 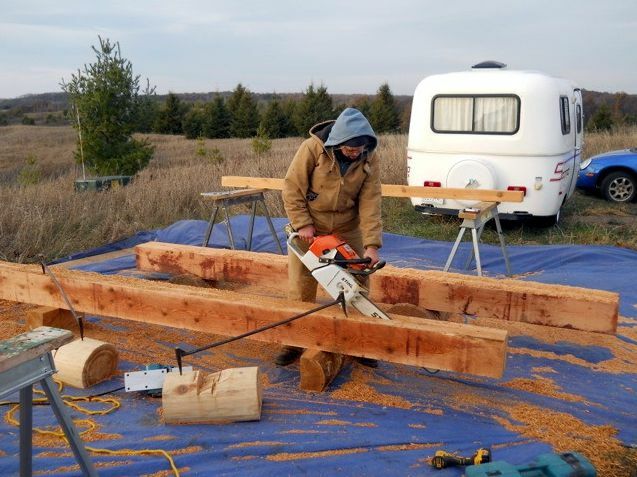 We arranged to meet with Eggerts at their site and took a look at what restoration was needed on their log home. 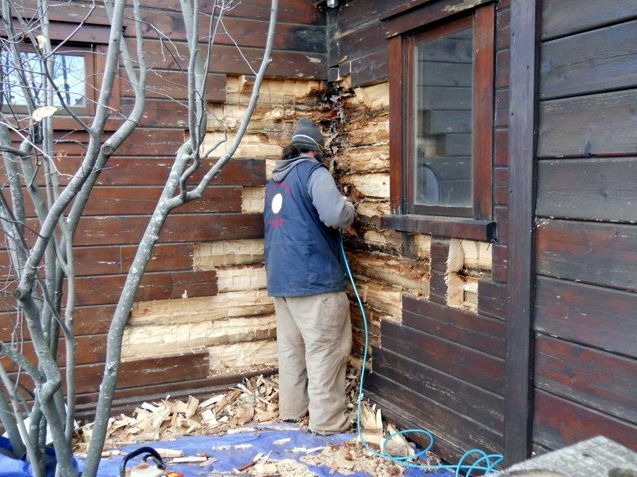 This home had flat or hewn logs, which means the logs are flat on the inside and outside. 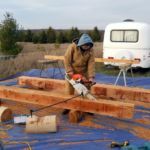 This is still a log home – it’s just a little different than the typical Midwestern round log home that most people think of when they picture a log home. For years, a failing gutter system had allowed water to drip into the corner of the house. Over time, the moisture encouraged rot, and the corner rotted out. 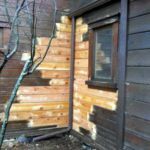 Overhangs, inadequate or missing gutters, or other gutter problems are a very common cause of rot in log homes. This leaky gutter caused this corner to rot. New cedar logs installed and ready for a coat of stain once the temperature warms up in the spring. Starting the tear out process. Rot like this attracts wood boring insects who like to feed on decaying wood. Digging into the logs to remove all the rot before installing cedar half-logs. Fashioning the new cedar replacement logs. We completed this log repair project in November of 2013. The project took about a week from start to finish. 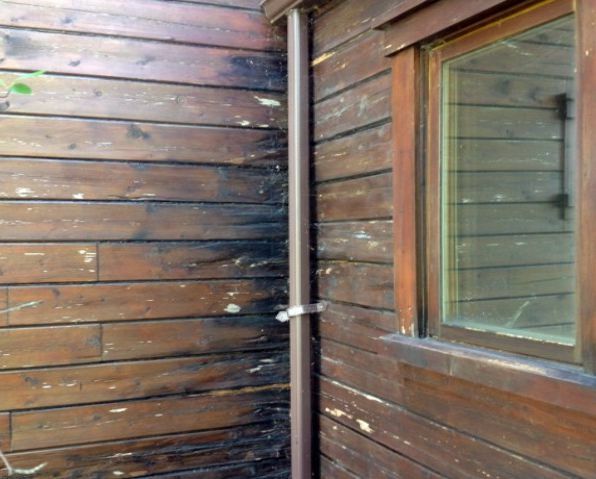 On this home, the rot was really concentrated in just one corner. 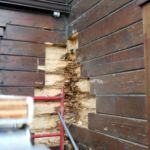 Problems like this are very typical of log homes that are 20 or more years old. Check out the slide show above to see the process we used. 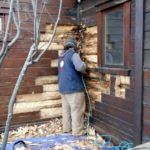 How do we keep a log home dry and stop rot?